I was at Oakland Airport for 10+ years, and Hayward for 8+ before I even noticed the Civil Air Patrol. How is that possible? And how did I become aware of the Civil Air Patrol let alone join? Well, 445CP was hard to miss at the Hayward open house in May of 2013. SM Choate, and Lt Michelogiannakis. She was so shinny and beautiful, I had to stop and ask "What does the Civil Air Patrol do?" I was greeted by a guy named Ken who answered with "I'll show you", as he proceeded to guide me into the cockpit. I thought "well, this will be a waste of time, I own a plane." Then I saw it, like the sun shining down through the clouds, the most beautiful instrument panel I'd ever seen up close. I thought "Why is he showing me this? Don't you have to be Military to fly this? 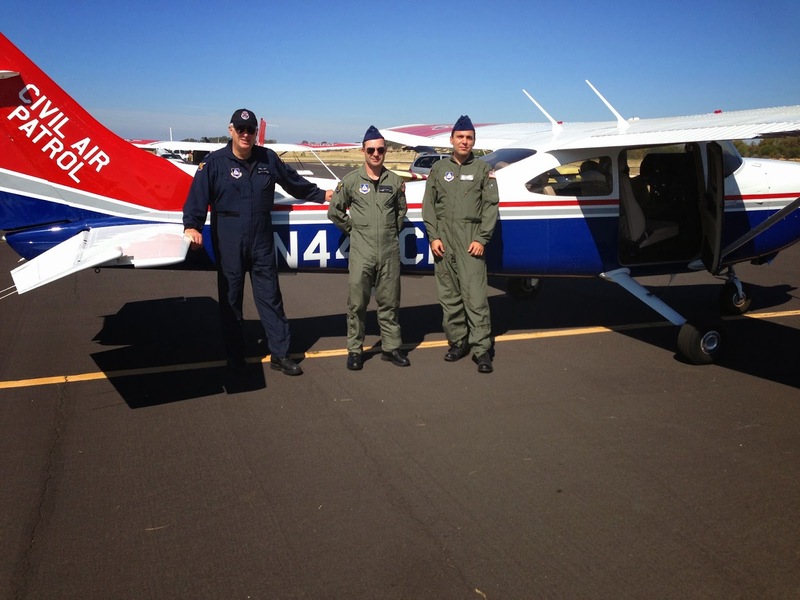 I assumed since everyone was wearing flight suits or camo." As I drooled over the G1000 glass panel Ken asked if I was a pilot. I responded "Yes!" To which he responded "You know, you could fly this..." I said "What? How? Where do I signup?" Well, after he demonstrated some of the cool features of the G1000, he introduced me to Chris Johnson. Chris proceeded to explain what CAP did, and how he participated along with his wife, and how it sounded like CAP might be a good fit for me. Chris struck me as a real stand up guy, so that night, with the image of that G1000 still fresh in my mind, I checked out the squadron188.org website. The more I read the more I couldn't believe it. What an amazing organization and amazing group of people. Shortly thereafter, I attended some meetings, completed my application and before I knew it I was attending a SAREX at Oakland, then another at Auburn, then the Watsonville airshow with 445CP. I myself, a member for only 2 months, showed off her beauty to countless individuals both young and old. Since then, I've continued to be amazed at the dedication and commitment of the squadron188 members. I have yet to fly 445CP due to a backlog of pilots waiting to do the same, and can only imagine the wasted talent and enthusiasm for CAP in general and squadron188 in specific if 455CP is relocated. I for one would seriously reconsider my involvement and level of commitment to squadron188 and CAP in general without 455CP. This would be a loss for both CAP and squadron188 as I have already contributed my skills to help provide better reporting for squadron188, and help bring internet connectivity to the squadron188 hanger. These contributions are only the beginning, as I'm also skilled in construction, auto repair, RC planes and helicopters, model rockets, and wilderness first aid. Not to mention, I'd be happy to spend my weekends passing on my love of flying to our youth who in Oakland, more than any other city in the country, need to be exposed to something besides guns, drugs, and violence.